Meat is precious and Buddhist traditions are strong in Vietnam, which is why dishes of beef are considered a luxury. Clever cooks cut tender, marbled cuts into small pieces so they soak up flavor, then cook them quickly and serve them hot with aromatic herbs. Here, the peppery, salty-sweet, juicy beef mingles with the light salad dressing to create a great sauce that pools on the platter, perfect for drizzling over rice. Watercress leaves warm and wilt under the Shaking Beef (so named for the back-and-forth shaking of the pan), while their stems remain crunchy. To Make the beef:Stir together oyster sauce, soy sauce, sugar, cornstarch, fish sauce, pepper, and garlic in a medium bowl. If a saltier finish is desired, add up to 1 1/2 teaspoons more oyster sauce. Add beef, toss well to coat, and let marinate 20 minutes at room temperature. To Make the salad: Rinse onions in a strainer under cold running water for about 10 seconds; set aside. Whisk together 2 tablespoons water, vinegar, sherry, sugar, salt, and pepper in a large bowl until sugar is dissolved. Add onion; top with watercress, radicchio, and herbs. Do not toss. Heat a large, cast iron skillet over high, and add oil. When oil is shimmering, carefully add beef in a single layer. Cook, shaking pan every 30 to 60 seconds, until seared on all sides and meat reaches desired degree of doneness, 3 to 4 minutes for medium-rare. Remove from heat. Quickly toss salad, and transfer to a platter or serving dish. Pile cooked beef and juices on salad, and serve immediately. I recently traveled to Atlanta, Georgia for a conference recently. Although I pass through Hartsfield-Jackson Atlanta International Airport quiet frequently, I rarely have time to leisurely grab anything to eat while trying to get from one terminal to another to catch a connecting flight. However, this time I had an extended layover and being that it was lunch time, I decided to take full advantage of what the restaurant scene in the airport had to offer, and in checking the menu outside the establishment it appeared that One Flew South would fit the bill. Located in Concourse E, One Flew South is the first upscale dining experience in Hartsfield-Jackson Atlanta International Airport. The cuisine at One Flew South can be described a spirited global fare featuring a ‘Southernational’- Cuisine inspired by world travels specializing in Deep Southern and Asian flavors that cannot be denied with dished prepared largely with high quality, fresh, local ingredients from regional farmers and purveyors. An added bonus is that frequent fliers’ know that this Southern/Eclectic spot offers an exceptional prepared to-go selection for travelers as well. The food menus has offering covering soups and appetizers, salads, sandwiches and full entrees. The is a dessert menu for those that may have a sweet tooth, so be sure to ask your server to share it with you. One Flew South has a top shelf bar that serves proper cocktails and features an exceptional sushi menu and take-away items. 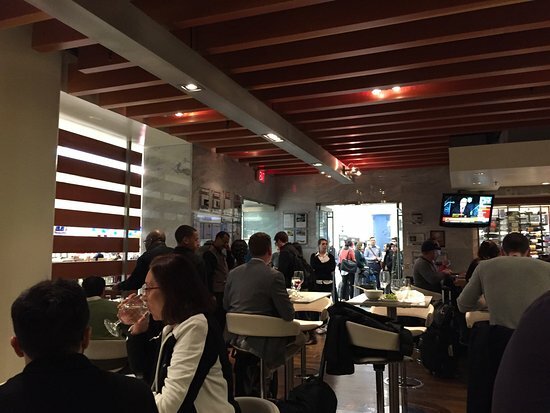 The restaurant presents an enticing culinary destination for travelers braving the world’s busiest airport. With that being said, I ordered the French Southern inspired duck confit croquettes and the thyme braised pork belly. The croquettes were made with duck, English Peas and Carolina grits and served with fennel slaw, candied citrus, Yuzu vinaigrette and topped with micro greens of cilantro and parsley. As for the entree,the thyme roasted pork belly was cooked to perfection and served over a bed of parsnip puree and a black-eyed pea and arugula salad. This dish is normally served with a blackberry-onion marmalade, but because the blackberries were not in season yet, the chef made do with a balsamic vinegar reduction. I am working on replicating this recipe and hope to post it at a later date. Stay tuned! The service was great and I truly enjoyed my meal and I could not wait to get back home to my kitchen to see if I could create such and interesting appetizer tailored to my taste. You see, cooking is pure happiness for me and I was truly inspired my first dining experience at One Flew South I start with this French inspired crispy Duck Croquettes recipe that is absolutely amazing. This process is a bit time consuming in terms of preparation, as they are a bit tricky to make, but they are so totally worth it. Make a few extra while you’re at it. You can keep them in the freezer, just ready to deep fry when you want to. To make the confit: Lightly sprinkle salt and pepper the duck thighs and fry in a little olive oil. Once it got nice color put it in a large casserole. Saute the shallots and add to the casserole with and garlic. Add wine and some olive oil. Place the casserole in the oven at 350°F for about 1 ½ hours, until the meat is soft and falling off the bone. Let it cool down to manageable temperature and pick the meat from the bone. Chop the meat finely and add to a bowl. Also, add the shallots from the casserole and add to the bowl. For the Béchamel: Add the onion and the butter to a medium saucepan and cook on low heat, until the onions are translucent. Whisk in the flour with a little of the milk to the saucepan. Stir and slowly add the remaining milk until a thick paste is formed. Bring to a boil, constantly stirring. Reduce the heat and cook over low heat for a short while, as the consistency should thicken. Taste and season with salt and pepper, as needed. Remove from the heat and set aside, allowing the béchamel to cool slightly. To a large plastic or stainless steel bowl, add about 1 cup of the béchamel, the chopped duck and the grated cheese. Season with salt and pepper, if needed. Place the bowl in the freezer to solidify the mixture, for at least 1 hour. This step makes it easier to manage the meat mixture. Spray your hands with a light coating of vegetable spray. Using a small ice cream scoop, fashion the croquettes, by rolling the meat mixture in balls, about 3 ounces each, and set on a plate. Place the croquettes in refrigerator for a least 4 hours. To make the candied citrus peel: Score grapefruit, oranges, and lemons through peel from top to bottom in 6 sections for grapefruit and 4 for oranges and lemons (don’t cut into fruit). Pull off strips of peel with your fingers. Slide a small, sharp knife along inside of peels to remove excess membrane so peels are about 1/4 inches thick. Cut peels lengthwise into strips about 1/2 in. wide in center and tapered on ends. Put peels in a 3- to 4-quart saucepan and add cold water to cover. Bring to a boil, then drain. Repeat twice more. Refill pan with 2 1/2 cups water and 2 1/2 cups sugar; bring to a boil, making sure that sugar dissolves. Add peels and bring to a boil, then reduce heat and simmer gently, stirring occasionally, until peels turn translucent and syrup begins to form bigger bubbles, about 1 1/2 hours. Meanwhile, make the yuzu vinegrette. In a blender or food processor, puree all ingredients except oil until combined. Slowly add oil with blender running until all of the oil has been added.If you do not have a blender or food processor, then add all the ingredients to a bowl and whisk until well blended. Decant to a glass mason jar or cuvette and set aside. To make the fennel slaw: Whisk together all ingredients except fennel. Trim fennel stalks flush with bulb, discarding stalks, and remove any discolored outer layers. Halve fennel through root end and discard core. Thinly slice fennel with a mandoline or other manual slicer.Place the fennel in a large bowl and toss the fennel with enough dressing to coat, then season with salt and pepper. Cover with plastic wrap and place in the refrigerator until ready to serve. When you are ready to fry the croquettes, set up the breading station. In the first shallow dish add the flour. Whisk the eggs and add them to a shallow bowl. Add the breadcrumbs to a third shallow dish. Dip a duck conift ball, first in flour, then beaten eggs and finally in breadcrumbs. Set aside. Repeat until all the balls have been coated. Add several inches of vegetable oil to a deep fryer or a large pot. Heat the oil to 360°F. Deep-fry the croquettes in batches, if necessary until they are a nice golden brown in color. Remove from the oil and allow to drain on a paper towel lined plate. To serve as an appetizer, with the fennel slaw,followed by the croquettes, topped with the candied citrus, micro herbs and the yuzu vinaigrette. * You can substitute cornstarch for the flour for a gluten free option. Also use gluten-free breadcrumbs as an alternative to the the Panko. **To save time, make the Citrus Candied Peel several days ahead and store at room temperature in an airtight container. ***This simple yuzu-soy vinaigrette goes well with many dishes, as a dressing for salads, cooked veggies, as a sauce for raw fish dishes such as tuna tartare or sashimi, or as a dip for homemade tempura. Yuzu marmalade (Yujacheong, 유자청), can be purchased from a local Asian Markets. If you cannot find Yuzu juice at your local supermarkets, you can use lemon juice as a substitute. Crispy potato and chorizo is a classic Spanish combination, so why not whisk up your eggs with this quintessential Spanish sausage and potato to make a decadent omelette with a salad on the side that can be served for breakfast lunch or dinner. Heat 1 tablespoon of the oil in a large ovenproof skillet over medium heat. Add the yellow onion and cook for 5 minutes. Spoon pan contents out and set onion aside. Wipe the skillet using a clean kitchen towel. In medium saucepan, add water, potatoes and a touch of salt and vinegar and over high heat, bring to a boil. This technique will ensure that the potatoes will maintain their shape without running the risk of breaking down or collapsing when added to the chorizo. Cook the potatoes until fork tender. Once the potatoes are par-cooked, drain them and heat 1 teaspoon of olive oil a separate cast iron skillet over medium heat. Fry the potatoes, tossing them and stirring them slowly so that they get a chance to build up a nice, even, crisp golden brown crust. Set aside. Once the chorizo is crisp, return the onions to the skillet and add the potatoes. Place the eggs, heavy cream, salt and pepper in the blender and mix until very frothy, about 1 minute. Heat another large ovenproof skillet over medium heat and, when hot, add the butter to the pan, swirling to coat. Pour the beaten eggs into the skillet immediately, adding the potatoes, chorizo and cheese, spreading everything out evenly. Using the rubber spatula, stir continuously and scrape down sides so as to evenly cook the mixture. Once the mixture resembles wet scrambled eggs, after about 30 seconds, use the rubber spatula to smooth the eggs so that they are an even depth throughout. Place the whole skillet in the preheated oven until the omelette is golden brown on top and just cooked through in the middle. Cook until almost set, about 10 seconds longer, and use the rubber spatula to fold the omelet in half. Carefully slide the omelette out of the pan onto the plate. Divide the arugula and red onion among plates and drizzle with the remaining olive oil. Cut the omelette into wedges and serve with the salad. Chorizo (Spanish) or chouriço (Portuguese) is a term originating in the Iberian Peninsula encompassing several types of pork sausages. Traditionally, chorizo is encased in natural casings made from intestines, a method used since Roman times. Chorizo is a Spanish pork sausage in which case it must be cooked before eating. In Europe, it is more frequently a fermented, cured, smoked sausage, in which case it is often sliced and eaten without cooking, and can be added as an ingredient to add flavor to other dishes. Spanish chorizo and Portuguese chouriço get their distinctive smokiness and deep red color from dried smoked red peppers (pimentón/pimentão). Due to culinary tradition and the high cost of imported Spanish smoked paprika, Mexican chorizo is usually made with native chili peppers of the same Capsicum annuum species, used abundantly in Mexican cuisine. Mexican chorizo is also highly seasoned with warm spices like cinnamon, cloves, and coriander, bright red from a combination of paprika andachiote, and tangy from vinegar and it does not need to be aged or cured. In Latin America, vinegar also tends to be used instead of the white wine usually used in Spain. Where Spanish chorizo is a firm, raw, dry-cured sausage flavored with smoked paprika and South American chorizos tend to be coarse ground garlicky sausages cooked in their natural casings, Mexican chorizo is that loosely bound, finely ground, by-the-pound, best when browned stuff that you’ll find in the fresh sausages department. It comes stuffed either into natural casings, or, more often than not, into plastic sleeves that need to be sliced and squeezed out before cooking.